Riverside Museum, Scotland’s Museum of Transport and Travel, is based on the banks of the River Clyde – directly across from central Govan. More than 3000 items are housed in a state of the art building designed by the Iraqi born architect Dame Zaha Hadid. Re-live life in Glasgow in the early 1900’s Main Street, climb aboard trains, trams and underground carriages and enjoys the dozen of cars, ship models and some of the more unusual objects on display. You can also climb aboard the Glenlee and see what life was like on board. More information can be found on the Riverside Museum website. 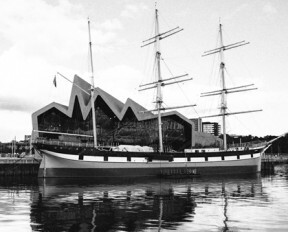 During the warmer months the Museum can be accessed by ferry from Govan. The Govan Ferry departs from the pontoon at the end of Water Row and the crossing takes around two minutes! 2013 prices and the timetable will be advertised on this website from March 2013.